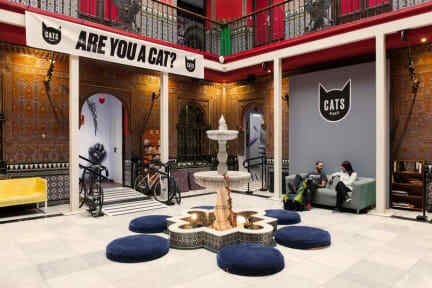 Cats Hostel Madrid Sol ist die neue Jugendherberge in Madrid, die für Sie entworfen wurde. Wir wissen genau, wie wir unsere Gäste zufrieden stellen können dank einer sauberen, bequemen und zentral gelegenen Bleibe in einer Vergnügungszone mit einem hervorragenden Nachtleben. Wir verfügen über kleine Schlafzimmer mit eigenem Bad sowie mittlere und große Schlafsäle mit gemeinsamem Bad (2 bis 16 Betten). Unsere Zimmer sin bequem, modern und sauber. Cats Hostel Madrid Sol ist der perfekte Ort für Ihren Madrider Besuch. Wir bieten Gratis-Frühstück, niedrige Preise und gute Stimmung. CATS Party Hostel is a great place to meet new people, thanks to all the their different events like tapas tours, beer tours, walking tours and pub crawls. Everything was really clean, the staff was super nice and helped you with any problem. All in all everything was perfect, you just shouldn‘t get mad if you get woken up by party people in the middle of the night or early in the morning (6A.M.). Wirklich ein tolles Hostel mit netten Mitarbeitern, in guter Lage. Besonders die Bar und die Möglichkeit der Ausflüge jeden Tag haben mir gut gefallen. Really nice hostel. The issue with the cleanliness is that some of the guests do not flush the toilet or leave stuff in the shower. The rooms are a bit small but we enjoyed our stay! The friendliest, most helpful staff and their awesome parties make this hostel my favourite in Madrid 😍. I love the vibe of this place and the people I met there 🌻🌞. Gutes hostel um Leute kennenzulernen und Party zu machen, oder günstig zu übernachten, solange einen laute Musik und Feiernde nicht stören. Großes Angebot, zb pub crawl, tapas tour oder free walking tour! Ansonsten sehr gemütlich und schön eingerichtet, für ein paar Nächte genau das richtige. Leider keine Küche! All in all its a nice Hostel with nice party possibility s but there are some things left for example there is no kitchen, the freezer is to smal for that amount of people and there are many. U are not allowed to take your own alcohol in the hostel - you can only buy it in the hostel. You payed for the drink but can not drink it outside?!.. I don’t understand that rule. This hostel is really only for people who want all day party and don’t really care about there budget (-> no kitchen ). Sehr zuvorkommender Mitarbeiter. Er hat durch seine Umsicht dazu beigetragen, dass ich meinen Flieger nach Vigo noch erreicht habe.